A former Roman Catholic church in Truro, the “Our Lady of Perpetual Help” Church, at 17 Pond Road, has been reborn as the "Chapel on the Pond". 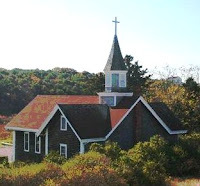 The Chapel will return to the purpose for which it was originally constructed almost 100 years ago. Following a period of restoration, the Chapel will be open for worship and praise of God, prayer, meditation, Bible study and getting acquainted. The Chapel is planning to continue year-round, with worship and prayer Sunday mornings at 10AM. Go to the Boathouse Ministries website for more details. Another friend took a few pictures of the sand sculptures at Easthan's First Encounter Beach on Saturday morning of Windmill Weekend. Take a look! When we first moved to Eastham and experienced, first-hand, the year-round climate, we became aware of the abundance of sunshine that seems to shine here. Our comparison, to be fair, was upstate New York. That said, it seems that taking advantage of the sunshine to lower our energy costs should be a no-brainer. However, the costs of system components and installation made a solar energy system unaffordable. The Wall Street Journal recently ran an article that highlights the fact that system prices are plummeting. A little research netted a few other interesting takeaways. This year will be the 8th annual Wellfleet OysterFest. The weekend (and the village) will be filled with fun things for the whole family to do and see. There is a 5K run, a tennis tournament, arts & crafts, an old fashioned spelling bee (both adults and kids), and the all-important oyster shucking contest. Go to http://www.wellfleetoysterfest.org/ for more information, a schedule of events and for instructions on how to shuck an oyster. We see a lot of stories about the many lighthouses that dot our landscape, but they are not the only interesting towers on the Cape. There is a curiously different tower in West Dennis, the Scargo Tower, not far off Route 6A that you can visit and climb. The view from the top of this 30 ft tower is quite extensive, on a clear day going all the way to Provincetown. Check out the video slideshow and story on CapeCodToday.com. And, read a bit more about the history of this tower on Wikipedia...Here. If you go see the Scargo Tower, check out the Scargo Cafe, just a short drive west along Route 6A from the Scargo Tower. It's particularly good for lunch. The 'art' of staging your home is simple making your home look like the potential buyer wants to see it. It shows your home in the best light, making it more likely to draw an offer. Consequently, your home will likely get a better offer. The difficult part of home staging is to do it cheaply and using materials that you already have. HGTV's FrontDoor.com has broken down home staging room by room. Take a look! My October 2009 Newsletter Is Available Now! Just listed today are 3 new ocean side building lots that are suited for 4 or 5 bedrooms homes. 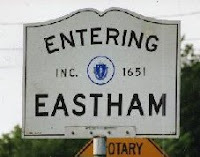 These Eastham lots are on/near Old Orchard Rd, between Brackett Rd and Nauset Rd. They are level and heavily wooded and are fairly close to the Cape Cod Rail Trail bike path and just a short distance to Nauset High School & Nauset Light Beach. These lots are priced to move quickly. Call me for details at 508-237-9545. Also just listed is a small ranch that is also on a 4 bedroom lot, adjacent to the above lots. Go to http://900OldOrchardRd.robertsheldon.com for photos and more details. Sharks have appeared at a good time off the coast of Chatham. Summer's winding down, but the prospect of seeing a shark off Chatham (or Orleans, Eastham, or Wellfleet) has kept the beaches busy with sightseers. There aren't many swimmers, however. The Cape Cod Times ran an extensive story about the sharks and their diet of seals ... Here. The article points out that large numbers of seals, and their predators, have the potential to alter the habits of many vacation goers and effect local businesses. It's never too late to benefit from others' mistakes. HGTV's FrontDoor online published a story recently that counted down, Dave Letterman style, the top 10 mistakes that home sellers make that can cost them real money. Mistake #10 is "Waiting for spring" to sell your house. Go to FrontDoor.com for the whole story. I remember watching in horror as the second plane hit one of the towers. It hit me then that what was happening was no awful accident, but the end of innocence for the US. What was to happen over the next few weeks, as the death toll increased and as we understood the depth of commitment to service of the many firemen and policemen who gave their lives in search of survivors, will be impossible for me to forget. EASTHAM - NEW LISTING - This immaculate 3 bedroom, 2 bath home has had many updates and has been meticulously maintained, including a new roof. The generous living room has a natural gas fireplace and is open to the dining room, with it's 12 x 14 deck with large retractable awning. Also off the dining room is the bright new sunroom. The house sits on a well manicured half acre,with circular driveway, professional landscaping, rear deck, and fenced back yard. Priced at $439,000. For more photos and a virtual tour go to http://20heritagehillcircle.robertsheldon.com/. This home sits on a quiet street off Herring Brook Rd, near Herring Pond and just a short bike ride to First Encounter Beach. Come see! An Eastham friend of mine, Carl Sylvester, has been working on a 12' Salt Bay Skiff in his garage for the last 6 months or so. Over the months he's called on my help a few times to simply help lift it and turn it over so he could work of the 'other' side. The final result is an incredibly beautiful boat that Carl should be very proud of. This past Friday he brought the boat to Great Pond for its official launch. Click on the photo, above, to get a larger view of Carl's work. What remains? - a name for this skiff. New Listing - Fixer-Upper On "Cape Cod Acre"
The opportunity to own a home on a Cape Cod acre (40,000+ sqft) at a great price has become available with this new listing on Old Orchard Rd, in Eastham. The house is a 1,200 sqft ranch style home with 2 bedrooms and 1 bath and a large common room with the kitchen at one end. The house has nice decks, a fireplace, and an outbuilding, all on a level, wooded lot, which would support a 4 bedroom home. 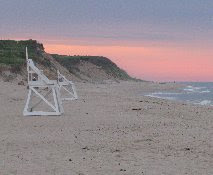 The location is on the ocean side of Route 6, away from all the Route 6 hustle & bustle, but a short bike ride to Nauset Light Beach. The home is listed at $279,000. Go to http://900OldOrchardRd.robertsheldon.com for more photos and a map of the property. Call me at 508-237-9545 if you'd like to see this house. 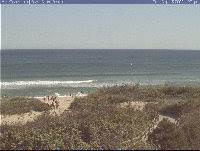 Here's another Eastham webcam that you can enjoy. This one is housed (I'm pretty sure) in the bathhouse at the top of the walkway leading from Coast Guard Beach, in the Cape Cod National Seahore. This webcam would have been useful during the last two weekends when we had the hugh waves from Hurricane Bill and Tropical Storm Danny. Check it out! Where's Waldo? - You Can't Make This Stuff Up! On occasion a story comes up that you wish you'd thought of - it would be a great story, even if it wasn't true. This story is true, even if it's not about the Outer Cape. Apparently there is a swimming robot in Florida named Waldo. Waldo has gone missing, either because it sank or just wandered off. The electronic tracking hardware has failed and the owners have been unable to locate it. Read about the 'missing' $130,000 robot on the Naples News website. Where's Waldo? The unfortunate scheduling of the Longboard competition during Hurricane Bill forced the postponement until a later time. That time has come..... here's the update. 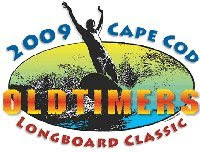 The 2009 Cape Cod Old Timers Longboard Classic is being held this year on September 6th (this Sunday) at 5 PM at Wellfleet's White Crest Beach. Watch some truly old folks tackle 8 foot (or longer) surf boards, frigid water, and without wet suits or leashes. Interestingly, the boards must predate 1970. Hmmm! I recently came upon an interesting article about identifying the various home architectures. 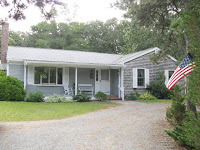 First on the list was the Cape Cod architecture. The article points out that the design dates back to America's beginnings in New England, re-invented in the 1920's and popularized in the 1950's and 1960's. In fact, my parent's first home was a small Cape in Yonkers, NY. Interestingly, the article notes pro's and con's of the style. The con's have been mostly eliminated by the modern versions we see in Eastham (and on Cape Cod) today. Read the article on HGTV's FrontDoor.com. While there, check out the other 17 home architectures presented. Ever wonder about your carbon footprint - your impact of 'planet earth'? National Grid has provided a calculator that should help you understand your impact. Additionally, they have quite a few ideas about how to reduce your footprint. Go to the National Grid calculator...Here! When it comes time to apply for a mortgage, your credit score will play a big part in the rates the banks will offer you. Your score, known commonly as your FICO score, is similar in many ways to the old SAT scores we used to get into college. The score runs from 300 (awful) to 850 (really, REALLY, good). A Money Magazine article, published online on CNN Money.com, provides a number of strategies for improving your score - a wise idea prior to applying for a mortgage. You will see that the task of improving your credit is as much an 'art' as it is a 'science'. Stellwagen Bank - What Is It? You've heard about the Stellwagen Bank, but have no idea where it is and why it's special. The Stellwagen Bank is a National Maritime Sanctuary that lies roughly between the northern tip of Cape Cod and the southern end of Cape Ann, pretty well covering the entire entrance to Massachusetts Bay and Boston Harbor. The sanctuary encompasses 842 square miles and is the seasonal home to a large variety of sea life, including several endangered sea mammals. The Stellwagen Bank's website contains a map of the area and lots of educational information. 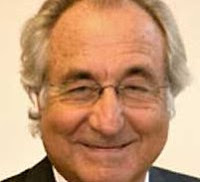 It was inevitable that our pal Bernie Madoff's holdings would be sold to pay his victims. The most recent piece of real estate to hit the news is his beach house in Montauk, Long Island. It's a modest 3,000 sq ft modern home on the beach, with a huge center room, 4 large bedrooms, an oddly shaped pool, and views. Take a look at the New York Times article, here, and don't forget the slideshow. Not bad. The Feds have put it up at $8.75M, but won't take a penny under $7M. Furnishings extra! 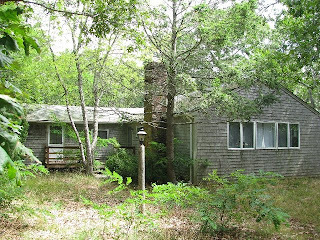 In the next few days I'll be listing several beautiful building lots on the ocean side of Route 6. These lots are level and wooded with two of them are on a short cul-de-sac; the other two lots are on a paved public road. These lots are suitable for 4 or 5 bedroom homes. I expect them to be priced very attractively. Pay close attention!